RJ Stuart Sprints to the Win in a hard fought at Hyde Park. Thanks for the report John!! RJ Stuart was able to notch another Texas Roadhouse Cycling podium today with a strong 2nd place finish in Urbana, IL at the Urbana Grand Prix. The race was a 1K course with 8 turns just outside of Lincoln Square in downtown Urbana. Big Day for Texas Roadhouse riders!! Congratulations to RJ Stuart on his win in Tour de Champaign Crit today. Nick Ramirez complete the podium with a solid third. RJ’s win adds to the Chad Burdzilauskas victory from Manhattan, KS (Curtis Tolson finished 2nd) as well as the 1-2 finish by Marian University and Texas Roadhouse racers Colton Barrett and Adam Leibovitz in the D1 collegiate National Championships held in Ogden, Utah. 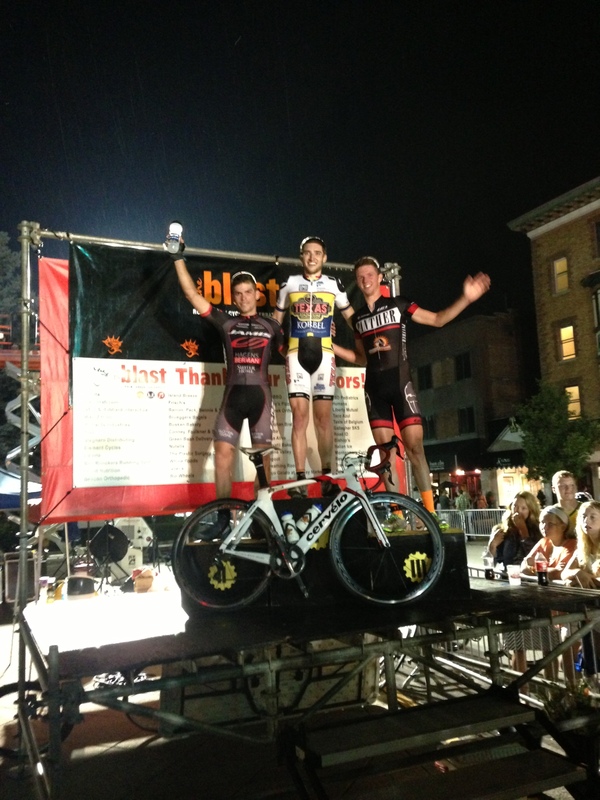 Colton Barrett is your D1 2013 Collegiate National Criterium Champion!